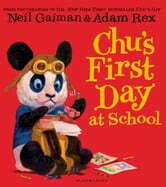 Chu is a little panda with a BIG sneeze and when his first day at school approaches he is nervous. Will the other boys and girls be nice? Will they like Chu? A fabulously warm and funny story about little Chu and his enormous sneeze! A fabulously funny story about first days at school - perfect for all the family! Brilliantly read by Neil Gaiman*. * Please note that audio is not supported by all devices, please consult your user manual for confirmation.